During the initial launch, Google Plus was limited to personal profiles unlike it’s rival Facebook which had a platform where brands can create pages for themselves. Plus was then a platform for connecting people to people and not with brands.During the initial phase it never allowed Brands to Create profiles for themselves by imposing strict name checks while creating the profile. In 2011 November Google however released it’s equivalent of the Facebook Pages, which they have termed as Google Plus Brand Pages. Creating a Google Plus Brand Page is very easy, and you wont take more than a minute to do that. You will be asked to pick a Category to which your business belongs. Pick one of them. If you are not sure what category your business belongs to, you can choose the “Other” Category as I did. 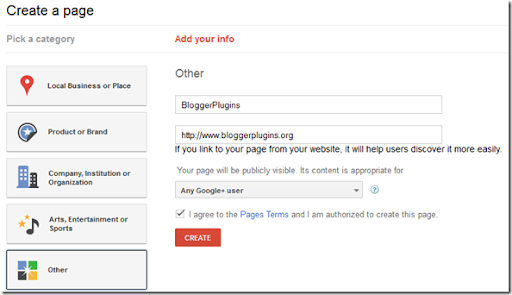 You will be asked to fill in some information like Name of the Page, and the URL of your Blog. You can see that I have given BloggerPlugins as the Page name and http://www.bloggerplugins.org as the link to my website. The next step is the most important of all. By now your Brand Page has been created and you have to let the world know of it. The first thing that you could do is to let the people in your Circles know about your Brand Page. The next screen will help you do just that.It will prompt you to share your page with those in your circles. You can choose whom do you want to share it with and post it to your Stream. 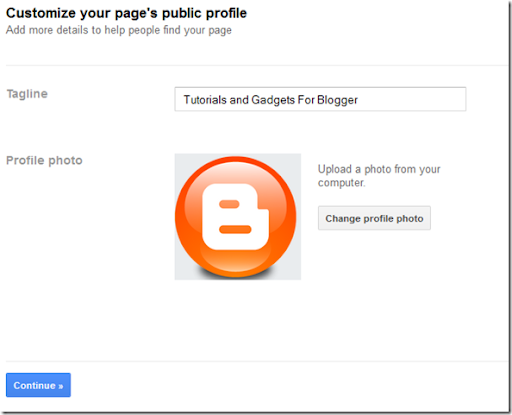 Click the Finish Button and you have successfully created your Google Plus Page. Wasn’t that dead simple? If you want to have more people who have your page in their Circles, then you will have to promote your Brand Page. 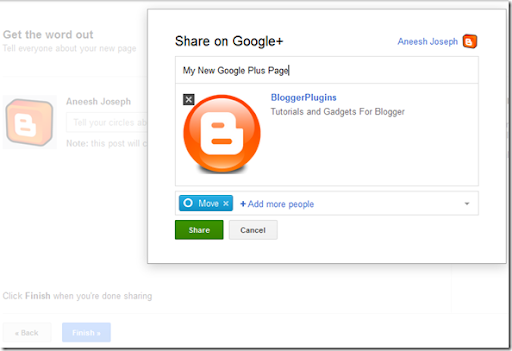 One way of doing it is by using a Google Plus Page Badge on your Blog. I have written a tutorial on adding a Brand Page Badge to your Blog. You might want to check that out :). I have created a website on Google Brand Plus, but how the issues push up on my blog to automatically go there, as is done with facebook, for example, whether to change my profile through the accounts of Google? If you Switch your Blogger profile to G+, then you would be provided with an option to share the post immediately after you publish it.